The ritual of Freemasonry is well endowed with symbols – things familiar that could convey a hidden meaning to those initiated. Man uses signs, pictures, emblems and words etc to convey ideas from individual to individual and some of the afore-mentioned lend themselves to symbolism more than others. This was especially so in the Age of Enlightenment during the 18th century and much more so in what we know today as the USA, which came under French influence. The War of Independence won, it was resolved on Independence Day 4/7/1776 by the Continental Congress [pre Senate] and the victors to set about to devise a Seal of the USA. Congress wanted a design that would reflect their values to future generations. Those involved were Benjamin Franklin, J Adams and Thomas Jefferson assisted by the artist Pierre Eugène Du Simitière. Du Simitière was an accomplished portrait painter and had designed the state seals for Delaware and Virginia. Today’s lecture, in the main, revolves round this Seal. 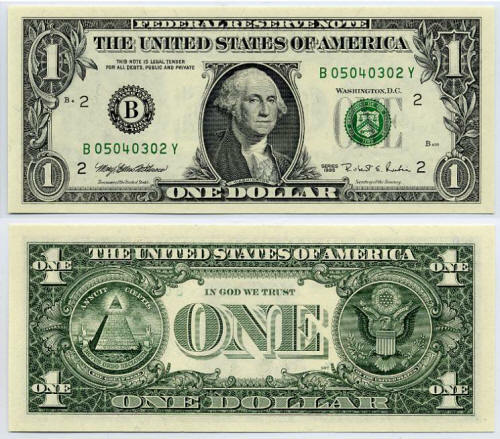 Some say that the Seal, now visible on the $ note, the enlarged forgeries of which are in your hands, is not a Masonic emblem but I shall leave that to your own conjecture. Six weeks later the first report was tabled and subsequently shelved for over 3 years. In 1780 the initial request was referred to a new committee. [Messrs.Lovell, Scott and Houston]. Artistic help was received from Francis Hopkinson who was also responsible for designing the new flag. However no further progress was made for another 2 years. [Charles Thomason] took it upon himself, with Barton’s assistance, to make some alterations and a third design inspired by Hopkinson's image from the 1778 fifty dollar bill [a pyramid surrounded by the word DEO FAVENTE PERENNIS = God favouring through the years] was then resubmitted via the committee to Congress and the Seal was approved. I refer you at this point once again to the green sheet in front of you. I have here also a colour image of the Seal. Arms: Paleways of 13 pieces, argent and gules; escutcheon on the breast of the American [ Bald] eagle displayed proper, holding in his dexter [ right] talon an olive branch , and in his sinister [ left ] a bundle of 13 arrows, all proper, and in his beak a scroll inscribed with the motto, “ E PLURIBUS UNUM"
For the CREST: Over the head of the eagle, which appears above the escutcheon, a glory, or, or breaking through a cloud, proper, and surrounding 13 stars, forming a constellation, argent, on an azure field. ANNUIT COEPTIS: What does this mean? With the motto ANNUIT COEPTIS the subject of the verb must be supplied, and the translator must also choose the tense. In 1892 it was suggested that the missing subject was in effect the eye at the apex of the pyramid ... and thus the motto became-in the present tense-as "it (the Eye of Providence) is favorable to our undertakings." In later publication the missing subject of the verb ANNUIT was construed to be God, and the motto has been translated in more recent Department publication-in the perfect tense- as "He (God) has favored our undertakings". NOVUS ORDO SECLORUM: What does this mean? The motto has been traced to Virgil, the renowned Roman poet who lived in the first century B.C. – to a line in his Eclogue IV, the pastoral poem that expresses the longing of the world for a new era of peace and happiness. The ages' mighty march begins anew. "Novus" means: new, young, fresh, novel. "Ordo" means: series, row, order. "Seclorum, a shortened form of seculorum (sæculorum), is the plural of seculum (sæculum), means: generations, centuries, or ages. Thomson, a Latin expert, coined the motto: "novus ordo seclorum"
and explained its meaning: "The date underneath [the pyramid] is that of the Declaration of Independence and the words under it signify the beginning of the new American Era, which commences from that date." "A new order of the ages"
NOTE: "Novus ordo seclorum" was not intended to mean (nor does it correctly translate into) "new world order." Seclorum is plural (new worlds order?). And Thomson said the motto refers to the beginning of a new age – an American era beginning in 1776. The pyramid's rising rows of construction help illustrate this new series of generations. Thus together, the words signified the beginning of the new American Era commencing from that date seen at the base of the Pyramid. Castings for seals were done in 1782 and 1841 but in 1883 the reverse was officially rejected by a committee headed by Professor Elliot Norton of Harvard University who said unequivocally that it was a dull emblem of the Masonic fraternity. It was never cut! Further more it was never really seen until 1935 when it appeared on the dollar bill. Now, are the symbols on this Seal Masonic or here by chance? Is it our wishful thinking? Let us examine these one by one referring to the copies in front of you. Let us reflect and consider whether they are Masonic or whether we are deriving Masonic benefit from them. A point of historical interest. : Before continuing, I should like to clarify that the Great Seal is like a coin with two sides which now appear on the one $ bill at the instigation of President Roosevelt in 1935; separated left and right – the front [ obverse ] being on your right and the reverse [ the pyramid ] on your left. I also wish to point out hat the face of the eagle originally faced the arrows but on President Truman’s insistence was redirected in 1945 to the olive branches. The eagle has 32 feathers on its right wing, the number of ordinary degrees in Scottish Rite Freemasonry. The left wing has 33 feathers, corresponding to the 33rd degree of the same rite conferred for outstanding Masonic service. The tail feathers number nine – the number of degrees in Chapter, Council and Commandery of the York Rite. Scottish Rite had its origins in France which with the York Rite being American there is a representation of union of French and American masons in the struggle for Liberty, Equality and Fraternity. The total number of feathers totals 65 which, by gematria, is the value of ‘gam yachad’ ( 3+40+10+8+4) [Psalm 133- Hinei ma tov etc] a phrase often used in Freemasonry. The glory above the eagle’s head is divided into 24 equal parts reminiscent of the 24 inch gauge and is emblematic of the service you are to perform every hour of the day. The 5 pointed star may remind you of the Masonic Blazing star and the 5 points of fellowship. The arrangement of the stars in the aforementioned constellation can form overlapping equilateral triangles and this, the Star of David, brings to mind the dream of a Temple. The gold silver and azure colours represent the sun moon and the WM i.e. the three small lights certainly of the Nederlandic rite [which had its origins in France]. The golden glory may remind you of the letter G, a conspicuous furnishing in any Lodge room. The colours of the shield on the Eagle’s breast – red, white and blue –are familiar to Royal Arch Masons. On the reverse [your left] is the All Seeing Eye within a Triangle surrounded by a golden glory. Besides the obvious Masonic significance of this design [just look behind the WM] it is also evident on the jewel of a Grand Master. – but not known before 1782. However this triangle is equilateral entertaining a reference to the number 3; of Masonic interest. The triangle is well known to all masons and may represent the capstone of the unfinished pyramid. An isosceles triangle [2 even length sides] illustrates the Pythagorean Theorem or 47th Problem of Euclid. Note that this triangle is not equilateral. Look carefully. The pyramid has 13 steps. It has light and dark sides – symbolical of the profane and initiated? So how are we doing so far? Who is in favour of accepting Masonic influence? Now let us pay attention to the Treasury Seal – the side with George Washington’s picture. This Seal in its present form dates from1968. To many of you, without a shadow of a doubt, this is definitely Masonic; especially to those in the Scottish Rite, previously mentioned. However let’s look closer. It is NOT a square; it is a Chevron. The chevron represents the roof of a house, derived from the French word "chevron" meaning rafter. It signifies protection. An artist may draw the chevron at the height and angle that will best suit the accompanying charges. Prior to 1969 the chevron did indeed look like a mason’s square. Notice the date. This is the year the Department was created. 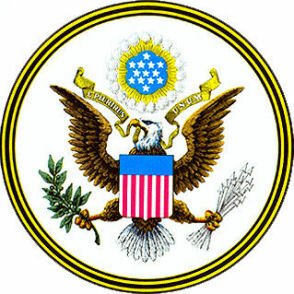 By the way, the basic design of the Treasury Seal is older than the Federal Government. So there is nothing really surprising here .That Freemasons use these symbols in a symbolic manner could be a matter of expedience. A note about Scottish Rite: was founded in France 1754 and formalised in USA in 1786 but I shall point out here that Benjamin Franklin was Ambassador Royal to France and well acquainted with French Masonry. I am now going to return to the original principles and concerns behind the original artistic creation of the one dollar bill. These four men worked together and independently for a month and then each presented a design to Congress. Adams presented a design by Simon Gribelin entitled "Judgment of Hercules". From a note in Benjamin Franklin's own handwriting he proposed a Biblical scene. "Moses standing on the Shore, and extending his Hand over the Sea, thereby causing the same to overwhelm Pharaoh who is sitting in an open Chariot, a Crown on his Head and a Sword in his Hand. Rays from a Pillar of Fire in the Clouds reaching to Moses, to express that he acts by Command of the Deity." The motto Franklin chose was "Rebellion to Tyrants is Obedience to God." Thomas Jefferson's concept was an image of the children of Israel being led through the wilderness by a cloud by day and a pillar of fire by night. For the reverse he suggested an image of the brothers Hengist and Horsa who were the leaders of the first Anglo-Saxon settlement in Britain. In three other early designs a harp of David was depicted. Most of the designs included an olive branch including the final approved design and it carries on to today's seal. The Biblical symbolism of the olive branch is of hope and peace, the number of olives and leaves were not finalized at thirteen until later committees. Now we understand why it was rejected and the project shelved. The single eye was a well-established artistic convention for an 'omniscient Ubiquitous Deity' in the art of the Renaissance. The eye of Providence was part of the common cultural iconography of the 17th and 18th Centuries In 1614 the frontispiece of The History of the World by Sir Walter Raleigh showed an eye in a cloud labeled "Providentia" overlooking a globe. Du Simitiere, who suggested using the symbol, collected art books and was familiar with the artistic and ornamental devices used in Renaissance art. When placed in a triangle, the eye went beyond a general representation of God to a strongly Trinitarian statement. It was during this period that Masonic ritual and symbolism evolved; and it is not surprising that many symbols common to and understood by the general society made their way into Masonic ceremonies. Masons may have preferred the triangle because of the frequent use of the number 3 in their ceremonies: three degrees, three Original grand masters, three principal officers, and so on. Eventually the all-seeing eye came to be used officially by Masons as a symbol for God, but this happened towards the end of the eighteenth century, after congress had adopted the seal. 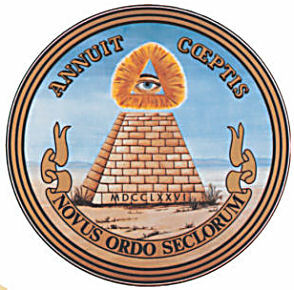 As far as can be established the All Seeing Eye was adopted by Masonry in 1797. It is tenable, possibly, to draw a correlation with our 2 pillars - strength and establishment. Remember that Barton was a Freemason. However, you will never find a pyramid being used as a symbol in a Masonic ritual. It has been said that this design was done deliberately in recognition of Chaim [Haym] Solomon (1740 - 1785) who was a prime financier of the American side during the American War of Independence against Great Britain. A Jew born in Prussia/Poland, he died in Philadelphia, Pennsylvania. He was the paymaster-general of the French military forces in the early times of the United States. It is asserted that over $100,000 he advanced was never repaid. He lent the young United Sates government about $600,000, and at his death about $400,000 of this amount had not been repaid. This was irrespective of what he had lent to statesman and others while performing public duties and trusts. "Financial Hero - Businessman and broker Haym Salomon was responsible for raising most of the money needed to finance the American Revolution and later to save the new nation from collapse." Many Historians have said that without his contribution to the cause "there would be no America today". Everything I have written is not original work and is available on the Web in many various sites, some more accurate than others. Indeed there are several Masonic lectures and question& answer postings. However research was needed to bring the whole together and I am grateful to all those who went before me to make my preparation a little easier. I thus conclude that the Great Seal is not a Masonic emblem and nor does it contain hidden Masonic symbols. Masonry did, I am sure, borrow and include these imageries wherever it was expedient to stress a point symbolically. All the rest is coincidence and wishful thinking, and in many cases propagated by persons with distasteful anti-Masonic criticism.